Employees leave for a variety of reasons. The Exit Interview is an ideal way to identify any underlying issues relating to a staff members' resignation. 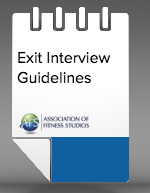 This template includes over 40 questions to customize your exit interview and ensure the highest level of job satisfaction for your studio's existing and future staff.